Here’s a unique way to watch the sunset! 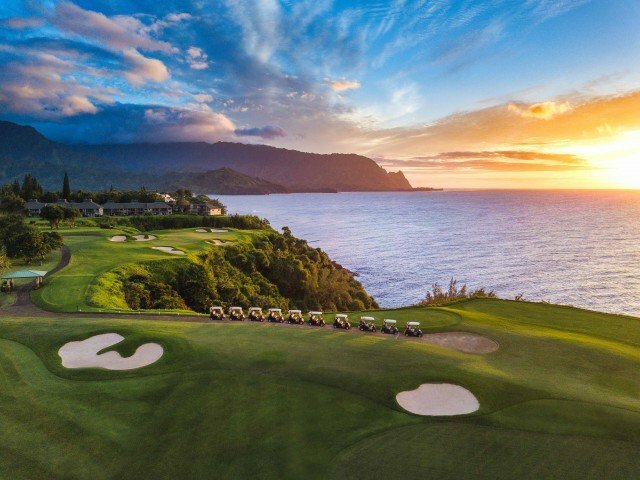 On the Sunset Cart Tour you will drive around the beautiful Princeville Golf Course on one of their cushy golf carts capturing incredible photos from various stops along the 18 hole Makai course. The best part is that you don’t have to be a golfer! And, no reservations are needed so you can wait until you are pretty sure the weather is going to cooperate. Two hours before the sunset, people start gathering at the Princeville Golf Shop. First stop is the Makai Grill where guests order a few refreshing beverages, at Happy Hour pricing, to fill their on-cart ice chests. Then the carts are doled out and and guests jump into their designated cart for the one and a half hour late afternoon experience. The line of carts, led by a Princeville Golf Course pro or employee, meander through the course, designed by Mr. Robert Trent Jones Jr., on smooth paths, stopping at five especially scenic spots. The guides (Tom, Randy or Andrew) talk story about the north shore flora and fauna, including the many different kinds of sea birds soaring over the ocean. Queen’s Bath, The Kilauea Lighthouse, Puff the Magic Dragon, Anini Reef, numerous North Shore beaches including Secrets, Lumahai, Haena, Anini, Hideaway, Waikoko and Hanalei Bay will be pointed out along the way. The Hawaiian state bird, Nene, and the seasonal Laysan albatross with their chicks, are extra, visual treats to see on the golf course. Photo opportunities abound. The latest news regarding the Kauai road opening was in today’s (April 11th) Garden Island Newspaper. As many of you know, the road west of Hanalei Bay to Ke’e has been closed since the April 2018 Kauai flood. Many people, residents and guests, have been anxiously awaiting its reopening. Lumahai Beach, Tunnels, Ke’e and the Kalalau Trail have been closed off for over a year to all except the people who live in Wainiha and Haena. A convoy schedule has been in effect for these residents. But, before you get too excited, the announcement that there will be a tentative reopening on or about May 1st is not all that it seems. The repairs to numerous landslide and road collapse areas will be largely complete by that date. But, the continuing restrictions will make actually using the highway challenging for both residents and visitors. Not only chickens should be concerned about Kauai traffic! With two people being born and one person moving to the island each day, Kauai’s population has now passed 72,000. Although this is still much less than the other major Hawaiian islands, the infrastructure has not kept up with the population growth. 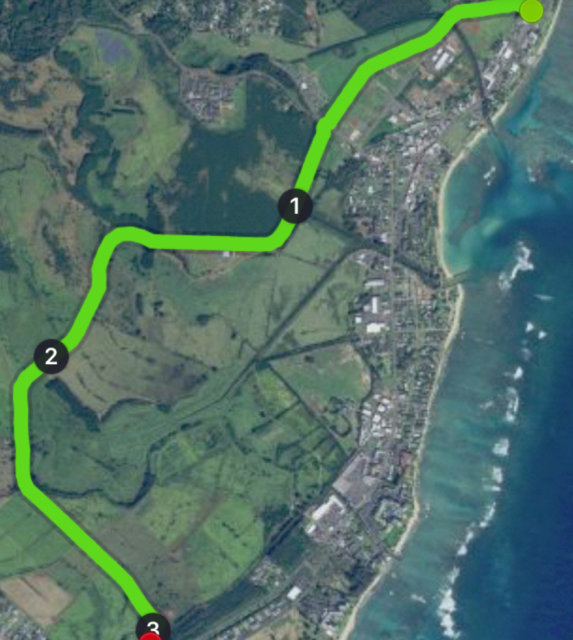 The one highway that wraps around the island from Polihale to Ke’e is, with a few exceptions, one lane each way. This leads to backed up traffic during certain times of the day. Here are a few hints as to how you may avoid Kauai traffic during your stay on the Garden Island. When traveling to and from the north shore and Lihue use the Kapaa Bypass Lane. The three-mile-long bypass is an alternate route to avoid the congestion and stoplights of Kapaa. It takes about 5-10 minutes to complete. Using the Kapaa Bypass could potentially save you up to 30 minutes or more drive time depending on traffic conditions in Kapaa. It runs in back of Kapaa, through some former cane fields owned by Bette Midler. Finding the entrance to the Kapaa Bypass is a bit tricky. 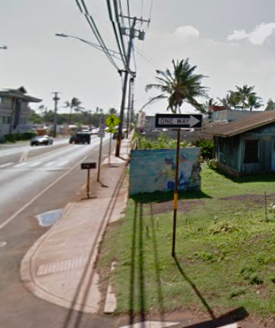 Driving north, once you pass over the Wailua River, drive by the concrete shell of the old Coco Palms Hotel (where Blue Hawaii was filmed), and go through one more light, start looking for a left turn lane right after Street Burger Restaurant (great burgers). Turn left and follow the road until you reach a traffic circle. Turn right and go to the stoplight (ABC Store). There you will find the highway again. Turn left and continue north. You have just passed the majority of Kapaa. One more mile and you will be on your way through the countryside to the north shore without another stoplight in sight. When driving south from the north shore the entrance is a little easier. Once you drive past the long stretch of beach (Kealia) just before Kapaa, you will go by the fire station and then be at the entrance to Kapaa. Turn right at the third opportunity. There is a mural painted on a wall which you can see as you turn. Food trucks and Otsuka’s Furniture Store (two story building) are on the left. You will be on a One Way road leading to a traffic circle. Check out the best view of Sleeping Giant (the mountain in front of you). Go straight through the traffic circle and out the other side. Drive until you meet up with the highway again. You will be very close to the Coconut Marketplace Shopping Center. Turn right and you are on your way to the airport or to the rest of the island. You are going to love me for this information! When heading south from the north shore, just as you come off the Kapaa Bypass, contraflow traffic cones are set up from 7:00 AM until 11:00 AM, to make one northbound lane into a southbound lane from the Kapaa Bypass exit to Hanamaulu, the town just before the airport. This relieves an incredible amount of southbound traffic. The cones are put up every day except Sundays and holidays. If traveling any place south of Kapaa, try to go before these cones are taken down at 11:00 because traffic starts building up almost immediately. The congestion may add an extra 20 minutes to your trip. There is a live traffic camera set up on the other side of the highway from the Kapaa Bypass exit which indicates, live, how many cars are exiting the Bypass. If you are planning to drive south after 11:00 I would suggest you take a look at the cam to see if you should leave earlier than planned. Traffic also backs up west of Lihue but, unfortunately there is no bypass to avoid the sluggish movement of cars. It is worse in the mornings heading into Lihue and in the evenings heading out of Lihue as business people go to and from work. Take a deep breath and enjoy the scenery. Speed limits on Kauai range from 25 mph to 50 mph. They change often so watch for signs. Remember, you can go only as fast as the car in front of you and there are few places to pass. Drivers tend to be very courteous and allow cars to merge into traffic. You will appreciate this once you try to exit a parking lot. One rarely hears a horn on Kauai. We do not have many traffic accidents on Kauai but, sadly, a few lead to fatalities. It most often happens when a driver crosses the center divide and hits an oncoming car. When this happens the highway is closed for an indefinite time, generally several hours. Sometimes there is a detour for traffic but other times it is a waiting game. If you are on your way to the airport, this is more than inconvenient. Therefore I recommend that if you have a night flight, you plan to have dinner in Lihue. Dukes, Kauai Pasta or Kauai Beer Company are some good choices. This way you will be close to the airport in plenty of time for your departure. So, yes, we do have some traffic issues on our tiny little island. I am betting, however, that they do not compare to the other Hawaiian islands or just about anywhere on the Mainland. One just needs to know how to work around them. Hopefully this blog will do just that for you. The key is to slow down and enjoy our Hawaiian time. For more of my blogs, or to subscribe, go to the right-hand side of this page (full screen computers). Mahalo! So, it is your last day on Kauai. You have had a fabulous time swimming, snorkeling, hiking and exploring Paradise. But check-out time is 10:00 and you have a red-eye flight. What to do all day without needing a shower before boarding the plane? Here are eight ideas for making that last day count, especially if you have been staying on the North Shore. 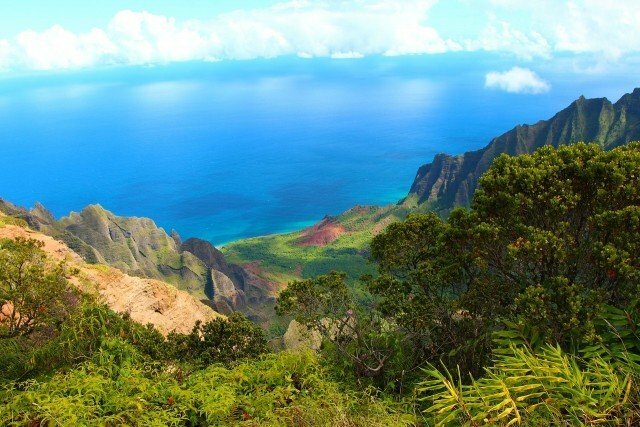 Save your trip to the Waimea Canyon and Kokee State Park for your last day. From the North Shore it is a LONG day. Depending on traffic it will take you about two hours to reach your goal. Once there stop at all the pull-outs for some fabulous sights and photo opportunities. Wonder through the small Kokee Natural History Museum (open daily, 9:00 – 4:00) and have lunch at the Kokee Lodge Restaurant. Do not miss the final lookout where, if you have clear skies, your view will be straight down the Kalalau Valley to the sea. Driving back, stop and take a short walk into the mountains or relax on the big meadow in front of the lodge. After coming down the mountain, stop at Waimea town and wander through the shops. Have a shave ice or an ice cream cone and enjoy the sunny, dry west side of the island. Hanapepe and Poipu are on your way back to the airport so there are plenty of places to stop if you have more time. End your day at Duke’s in Lihue where you will be close to your airport departure and may toast a perfect ending to your Kauai vacation. Not having to drive back to the North Shore shaves an hour off the trip. To read more about the last time I drove to the Waimea Canyon and Kokee, check out this blog post. When traveling to Kauai, or any other Hawaiian island, be sure to pack some reef safe sunscreens in your checked luggage. In July, 2018, Hawaii became the first state in the United States to ban the sale of sunscreen containing the coral-harming chemicals oxybenzone and octinoxate. The new law goes into effect January 1, 2021, but many residents and visitors alike are already doing their best to be environmentally conscience. Oxybenzone and octinoxate are not the only ingredients deemed to be potentially harmful to aquatic life, but according to several studies, they do contribute to coral bleaching. When coral bleaches, it is not dead, but under significant stress and subject to increased mortality levels. According to the National Park Service, 14,000 tons of sunscreen enter coral reefs every year. These two chemicals are believed to be one of the contributing factors to the coral reef destruction. So, what does this mean to visitors? As of now, the ban affects only the sell and distribution of sunscreens with these ingredients within the state but does not ban visitors from bringing them into the state. Given the reasons behind the law, however, please consider buying some reef safe sunscreens at home to bring with you or wait until you reach the islands to purchase one of these products. Some of the major sunscreen brands are making adjustments to their ingredients list in order to meet the restrictions of the new law. In fact, I was at Walmart the other day and many of the popular sunscreen brands already have “reef safe” on the label. Of course he/she is “my” albatross chick because, after all, he/she was born on my birthday and I was lucky enough to get to name her. Pela means “soar” in Hawaiian and that is what he/she will do in about four months from now. With in any luck, the fledge will take place off the bluff of Honu Point. Recently I uploaded two videos of Pela with Larry, his/her dad. The first shows Pela, at five weeks old, greedily asking for some food. Not this time. Lesson: patience is a virtue. Best with volume. One week later, Pela fares a bit better. This week’s lesson: everything in moderation. Again, don’t miss the communication between these two. Turn up your volume. Looking for an unusual way to spend the afternoon while tasting some of the best that Kauai has to offer? Try taking a food tour with Tasting Kauai. I knew little about this company until Stephanie Michel (photo above), a fabulous concierge that I recommend to my Honu Point guests, raved about the experience she had while taking each of the five food tours around the island. This is what stephanie posted on her Facebook page: “This is new FAVORITE TOUR!!! It’s a FOOD TOUR! They have several tours and I DID THEM ALL. They have them Saturdays/Tuesdays/Wednesdays/Thursdays and Fridays. NO EXCUSES! 5 TOURS TO CHOOSE FROM. (FIVE!) This is the best way to meet locals/See places there’s NO WAY you could otherwise see and get an insiders EDUCATION on what is going on here on Kauai. AND THE FOOD IS THE CHERRY ON TOP. IT’S ALL DELICIOUS! Not to mention the sweetest most knowledgeable guides I HAVE EVER MET ON KAUAI. I am going to scream this tour off my roof top!” Yes, Stephanie tends to get very excited about Kauai activities. If you find yourself falling in love with the albatross in Honu Point’s neighborhood, consider a walk with Cathy Granholm. She lives just down the street and checks on the albatross almost daily. With her computerized list of tag numbers handy, she scouts the neighborhood (and Princeville in general) to see which adults have flown in. She has been following some of these adults for years and has a family tree showing the lineage of many of the birds. She also checks each nest to make sure the chicks are progressing as they should. Cathy’s walks are fascinating, filled with facts, theories, and lots of stories about birds she has observed over time. Because albatross return to where they are born and where they nest, it is much like a family reunion each year when the birds return from the north. She, like I, and many of the neighbors, feel totally invested in their welfare. Cathy has anecdotes about who has paired up with who (not all mate for life apparently) and about times when she has had to step in and help out a fledgling trying to fly for the first time. There are some funny stories as well as some sad ones. I keep telling her she needs to write a book. On March 18th, a popular Kauai brewery, Kauai Beer Company, will be hosting “Beers For A Cause.” Not that most people need a reason to have a beer or two, on this day $1.00 spent on every pint or goblet will go to help Kauai’s animals in need. The Kauai Humane Society and Kauai Beer Company have joined forces to support this important cause. Daniel Hsu, bronze medal winner at the 2017 Van Cliburn International Piano Competition, will be performing on Kauai, March 8th. Characterized by the Philadelphia Inquirer as a “poet…[with] an expressive edge to his playing that charms, questions, and coaxes,” Daniel Hsu is the latest of the exceptionally talented performers the Kauai Concert Association brings to the island each year. We are lucky to have the Kauai Concert Association on our tiny island of Kauai. A large part of KCA’s mission is to provide music education outreach opportunities to Kauai’s students. The Education Services Committee works with school administrators and visiting artists to deliver live performances and master classes all over the island. KCA’s goal is to make world class music available to everyone on Kauai. Performances are held at the Kauai Community College Performing Arts Center and parking is easy and free.